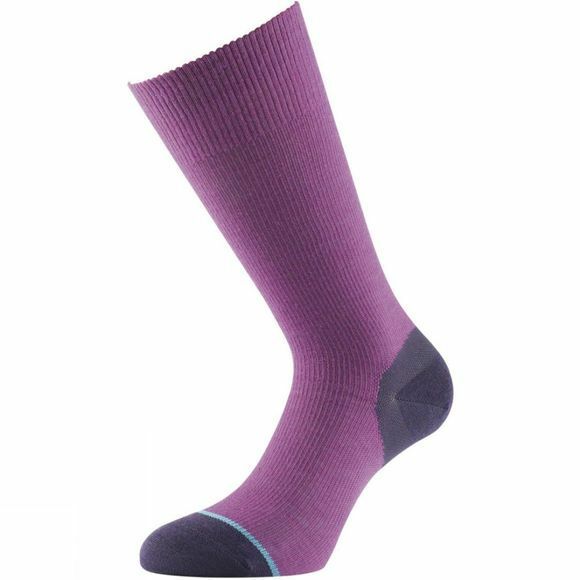 The Womens Lightweight Walking Sock from 1000 Mile is a sock within a sock. The 100% Tactel inner stays with the foot, wicking away moisture, whilst the soft wool-mix outer layer moves with the shoe. The lack of friction between the layers helps to prevent blisters and reduces wear. With the unique combination of merino wool outer layer and the Tactel inner layer helps to maintain a comfortable temperature for the foot. HeelPower grips the heel keeping the sock firmly in place and helping to reduce irritation on the skin. Mid -calf length, ideal for 3 season walking in all boots. This product contains Merino Wool: Merino wool is one of softest types of wool available and is perfect for regulating body temperature. The wool provides warmth without overheating the wearer and its moisture wicking properties combined with being slightly moisture repellent allow the wearer to remain dry.